Clip shows Elkana resident arriving at his business minutes before being murdered behind closed door; murderers seen escaping from scene. A video clip published today (Monday) documents the last moments in the life of Reuven Shmerling, the seventy-year-old Jew from Elkana who was murdered in a terrorist stabbing attack on the eve of Sukkot. The video shows the two terrorists from the village of Qabatiya in Shomron arriving at the industrial zone in Kafr Qasem, where they were employed by Shmerling. The video shows Shmerling appear at about 10:00 AM arriving at a storeroom, giving orders to his employees, and after a half hour, entering an inner door. Then, as can be seen in the video, one of the murderers leaves the room, takes a pick, lifts it, and bludgeons Shmerling. The two terrorists showered, left the warehouse, and fled. 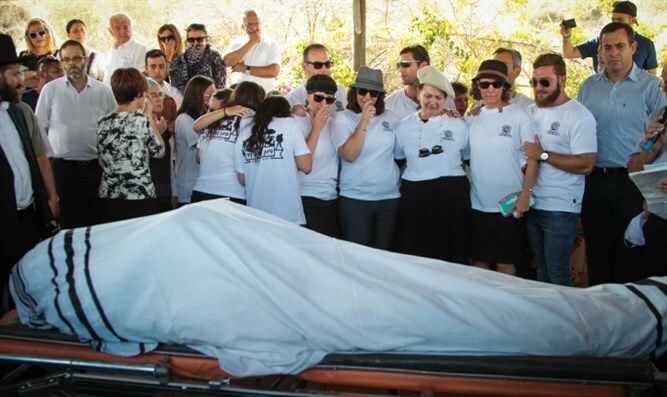 The Shin Bet and the police found the murderers within a few days. They confessed and reconstructed the murder.